Back cover of an advertising catalog for Adriance, Platt & Company featuring an illustration of a clock. Agricultural machinery parts serve as the hands of the clock. Stalks of bound wheat are arranged as roman numerals on the face, and the face itself is a circular map of the world. 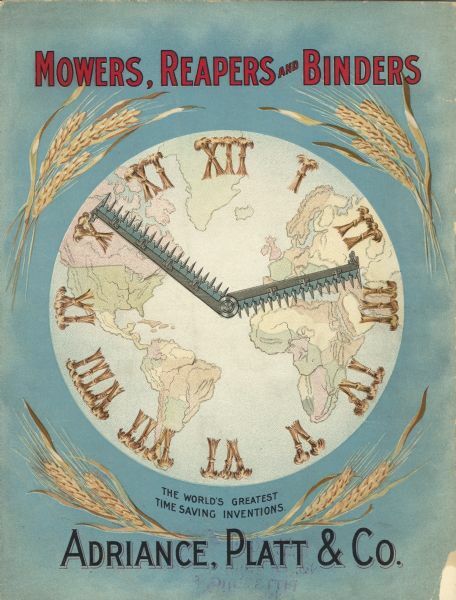 At the bottom is written: "The World's Greatest Time Saving Inventions." Adriance, Platt & Co. manufactured Buckeye and Triumph farm machinery. See also Image ID: 11674 for the front cover of this catalog.